I really enjoyed this book on an aspect of Elvis Presley's life that we've mostly just heard about. It's about his time spent in Germany while in the US Army. While trying to maintain his "image" as a singing (and movie) sensation in America, life was full of surprises for him and his friends. Presley has always been known as a womanizer and he apparently lived up to that reputation in Germany, by having numerous young women in his life, usually all at the same time. One such young lady was Elisabeth Stefaniak, who amazingly, stuck around while Elvis become involved with a young Priscilla Beaulieu, among others. Elisabeth was his secretary and lived in the home Elvis had arranged to house his father, grandmother, and an assortment of friends, during his tour of duty in Germany. Another friend was Rex Mansfield, who joined the Army on the same day as Elvis, and who became a close friend of the King. Rex and Elisabeth began their friendship/relationship, illicitly, while still in Germany and upon returning to the US, bravely broke from Elvis' clutches and got married. This is their account of their time with Elvis in Germany. It's well-written, informative, and very interesting. Conclusion - A very good read and I recommend it strongly. 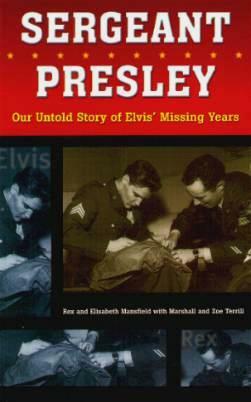 This is definitely one for everyone who likes a good biography, and not only for Presley fans.